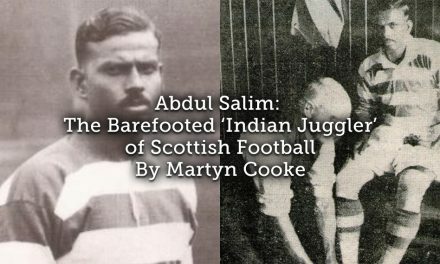 After I had been collecting football memorabilia for around 20 years or so it began to dawn on me that there was not a museum in Britain for our national sport. 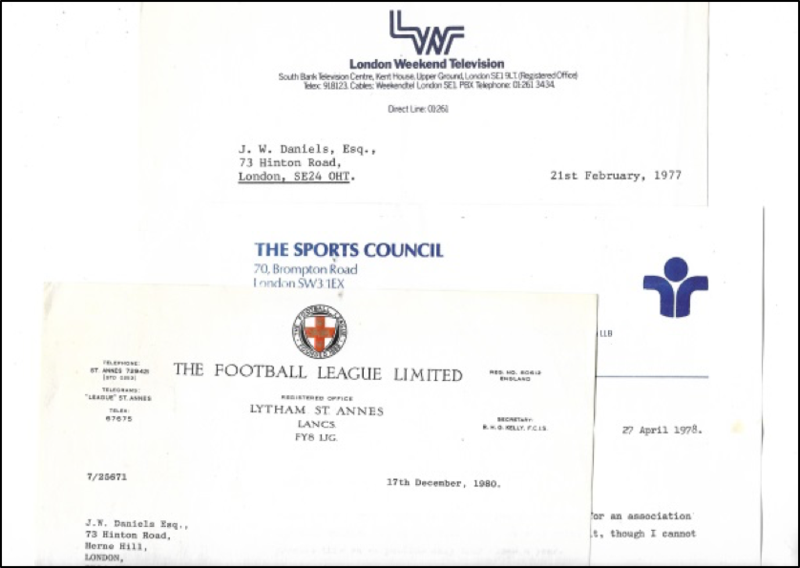 To this end during the 1970s and 1980s I made enquiries with several organisations in the football industry, the media and local authority’s. Regretfully, largely to no avail. 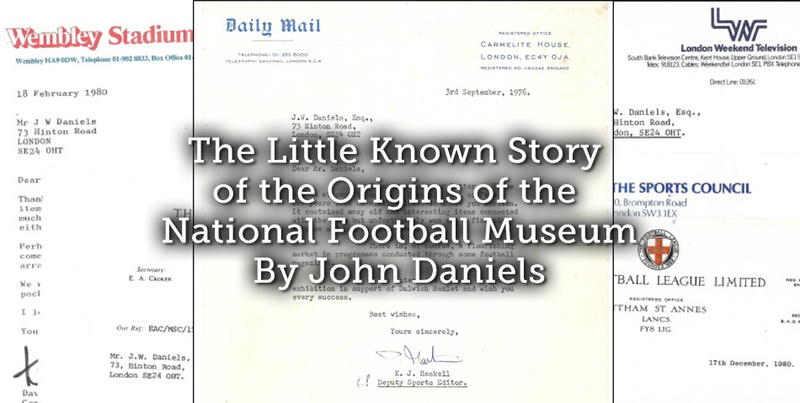 I thought my dream was about to materialise when around 1970 The Football Hall of Fame was set up in London. I had a few items on display at this exhibition and thought (or rather hoped) that this would provide the seeds from which a football museum would flourish. 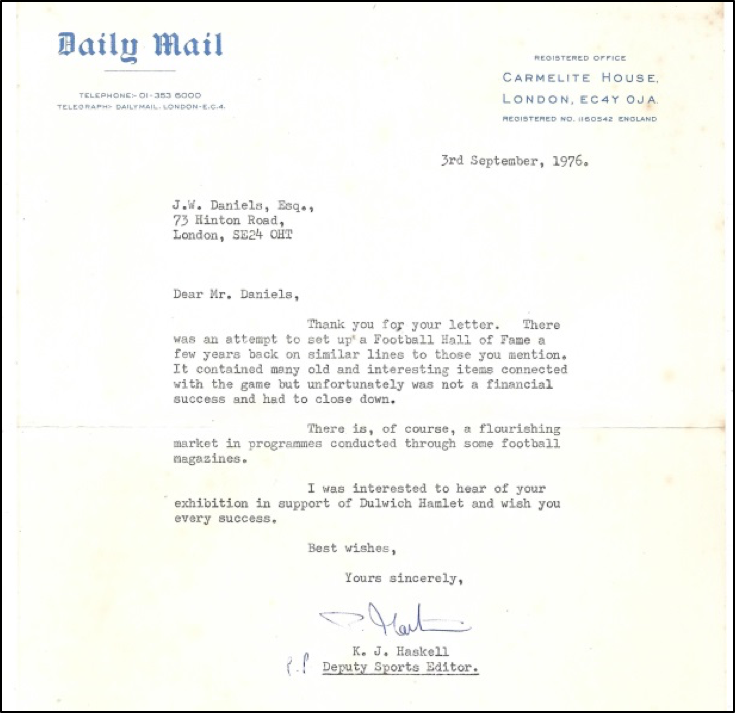 However the exhibition only lasted about a year and this rather put the whole idea of a museum on the back burner, the Hall of Fame was often cited as the reason for not repeating the risk, this reply from the Daily Mail provided a common response. 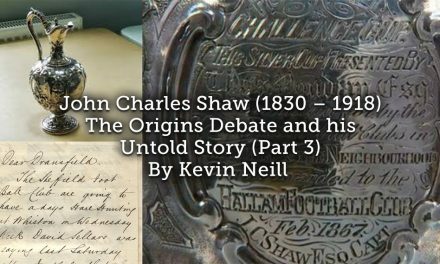 My hopes were dashed until a 1989 chance meeting on a train on the way to Glasgow to attend Christie’s first ever football memorabilia auction I met up with Graham Smith and Gordon Wallis who, like me, both had been collecting for many years. 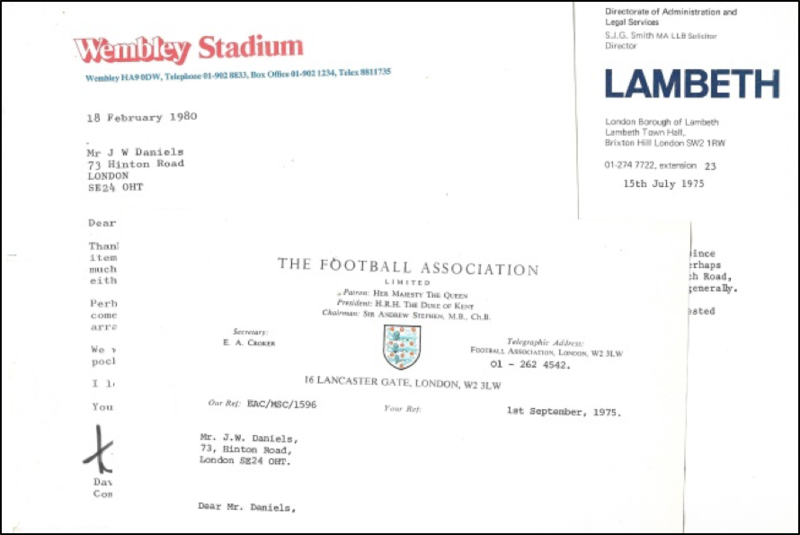 They also had the desire to see the formation of a football museum and within a short space of time ‘’Soccer Nostalgia’’ was set up and the aim of this organisation was to promote the need for a national museum. 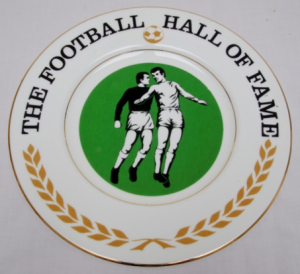 We exhibited at several football industries trade fairs, circulated various football authorities and mounted memorabilia exhibitions showcasing our combined collections at home and abroad. We had interesting meetings at The Football Association, Wembley Stadium and clubs including Carlisle United who were renovating their ground and saw the value of the museum as being part of their complex. The real breakthrough occurred when representatives of Preston North End, who were also renovating their ground, saw some publicity surrounding Gordon’s purchase of the Dixie Dean championship medal that he won with Everton during the season that he scored a record 60 goals. The sale price was a world record purchase price at the time and Gordon outbid Everton FC for it. 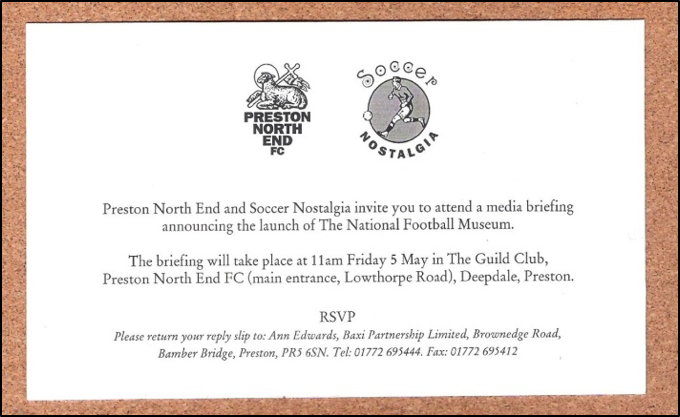 This created some interest in the press and was picked up on by Preston North End and they then thought that a museum would fit nicely into a portion of the new stadium structure. A press conference was held and it all looked so very good but regretfully, like most dreams, it did not quite work out as we had all wished. There were a few differences in the structure of the venture and we had to part company. One of the biggest personal regrets I had was on one of our visits to Preston we were treated to a great night out by a group of Preston supporters. I bitterly regret that we were not able to cement the relationship with them. However, Preston carried on with the project and sourced their exhibits from elsewhere and history tells us that it has since relocated to Manchester. There have been other attempts at permanent and temporary football exhibitions down the years and some clubs have their own museums, I have not managed to visit the current National Football Museum yet but plan to do so, it is very impressive by all accounts. Additionally I have not yet managed to visit all of the clubs museums but my personal favourite at the moment is the one at Newcastle United. 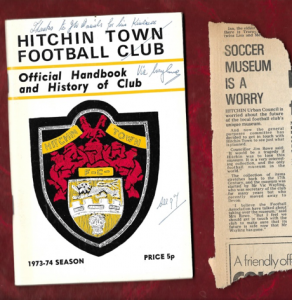 However, pre-dating all the above there was a football museum housed at Hitchin Town FC from the 1950s. 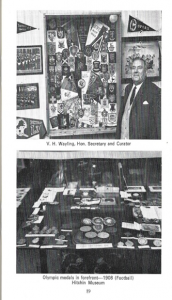 This was set up by Vic Wayling the Hon sec of the club. John was born in 1943 in South London and spent a large part of his life obsessively collecting football memorabilia, now in his self proclaimed dotage he decided to dispose of his collection as he thought it not be fair to leave such a large quantity of acquisitions for his family to dispose of when the big referee in the sky sent him for an early bath. 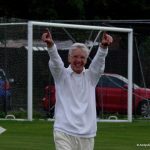 In more recent years, due to his daughter’s involvement in cricket, John has spent most of his spare time supporting various projects in Bexley promoting cricket for girls. The profits from all 3 books are being donated to support the girls’ cricket projects. John's professional life has been pretty mundane, he thinks - Telegram boy, Post office counter clerk, Cable and Wireless, The Army and various low level communications occupations (remember communications before it became I.T. ??). He has also managed to fit in a small (mainly part time) business dealing in football memorabilia. His books are not, he says, Harry Potter or William Shakespeare but they have done what they set out to do. The first one documented his obsession with collecting before the collection was disposed of. 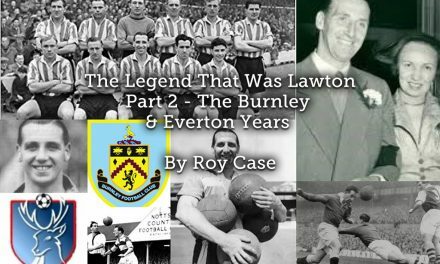 The second one diarised a season following a local non-league football club with terrific photographs by a friend who is an award winning photographer and the third one was back to the collecting theme by illustrating over 200 football postcards that he once owned. 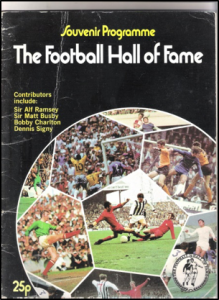 I visited the Football Hall of Fame in London in 1970, and the souvenir programme is very familiar to me. But where was it located?